The article then includes an exhibit showing the role of an operating model in the journey from strategy to excellent outcomes. This exhibit got me thinking. 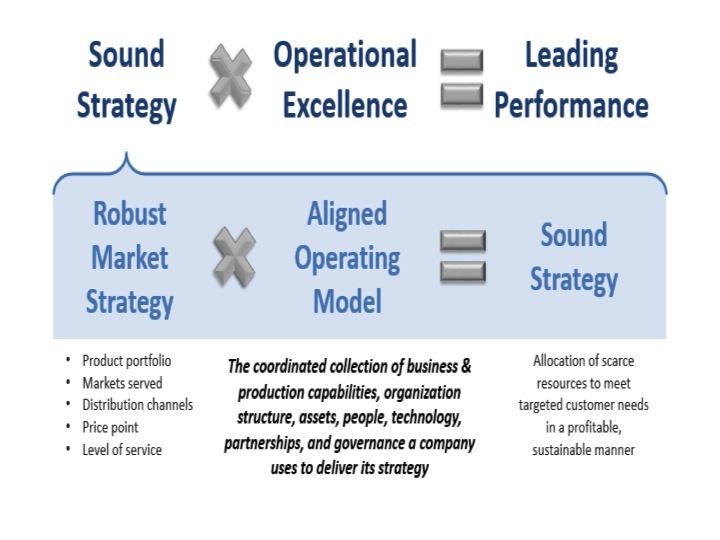 Is operational excellence all you need to turn “Sound Strategy” (a good market strategy and a good operating model) into “Leading performance”. My conclusion is no. My reasoning is as follows. When you have a new strategy, you need to develop a new target operating model to deliver the strategy. I agree that both of these are needed for a “Sound Strategy”. I also agree that too little attention is given to the target operating model in most strategy processes. But even with a “Sound Strategy” you still only have a set of ideas and plans on paper. To create the target operating model, you need a transformation process, consisting of a set of projects that will convert your current operating model to the target. Once you have implemented the new target design, you have not yet implemented the strategy. All you have done is set the organisation up so that it has the structure and capabilities and processes and …. that it needs to implement the strategy. You still need to run the organisation well (“Operational Excellence”) to deliver the strategy. This entry was posted in Design steps, Strategy and tagged Operating Models, operational excellence, Strategy, target operating model, Transformation. Bookmark the permalink. I think you are spot on here. Plans count for nought unless you have an effective process to activate. But therein lies the impact of culture (mindset), because it can derail everything. This is especially true at the Board – Executive interface because misalignment of mindset here can seriously weaken the leadership required to overcome potential cultural blockers. In terms of your equations, it may well be then that culture is a factor that modifies all three! Yes Richard culture is a modifier. We should take it into account when developing strategy both in the market strategy part and the operating model part. Culture will affect the transformation process. And culture will impact operational excellence. Of course the target operating model may require some changes to culture. This will mean some culture change initiatives in the transformation step … and some culture reinforcement initiatives in the operational excellence processes. Glad you enjoyed our article Andrew! And thanks for the discussion! Not to nitpick, but I would point out that our formula references an “Aligned” Operating Model, not a “Target” Operating Model. As you pointed out, identifying the target model isn’t enough. There has to be a transformation process to move to the target process. Our choice of the word “Aligned” rather than “Target” was meant to imply that the target operating model was implemented. Also, I would point out that we view a robust management system as a prerequisite for achieving Operational Excellence. A robust management system would require that the processes for translating strategy into execution (e.g. goals and targets, plans, metrics, roles & responsibilities, management of change, etc.) are established and implemented. Probably splitting hairs though. Bottom line is that you are absolutely correct that design, without a solid process for implementing it, is useless. That’s is why we use a multiplication sign. One without the other = zero. Good point Christopher. Thank you for adding clarity. I think we are on the same page. I have a colleague, Stephen Bungay of “The Art of Action” fame, who has specialised on strategy execution, building on the ideas of “mission command” from the military. What I have realised is that his ideas presume an existing “aligned operating model”. As a result, there is another whole dimension to strategy execution which is the design of the target operating model (which you consider to be part of strategy work and I think I agree with you) and the transformation from the “as is” to the “target”, which is about projects and programme management and sequencing and …. I partly wrote this piece to bring out my thinking about the two types of execution – changing the operating model and operating the operating model. There are multiple ways that we can describe these activities, some of them arising from different heritages and different schools of thinking, but largely being descriptive of the same activities. That becomes evident when Chris explains his intended meaning for “aligned operating model”, which I had not fully appreciated. Your set of equations seems an effective means of conveying the critical elements (from my perspective). I very much enjoyed your posts and discussions, thank you. Alex, I am not sure that I agree fully with what you are saying. Yes I do agree that the imbuing an organisation with an operational excellence capability is a design task and hence is part of target operating model design and the transformation needed to get from as is to target. But there is still a further element before you get to good performance – leading well and running the operations well. This is a different activity from the design and transformation activities. I find it really helpful to separate the task of designing from the task of running, just like you would in an IT function separate development from run.